The instructions of the Range Officer must be obeyed at all times. Any un-licensed person wishing to shoot, must present photo ID, fill out the proper register and be eligible to obtain a Shooter’s License. i.e. if there is any reason why a person may not be able to obtain a Shooter’s License, then he is not able to shoot on this range. Un-licensed shooters must not handle or use firearms except under the supervision of the Range Officer or his Deputy. Any un-licensed person not shooting may not handle any firearm or be on the firing line. All licensed shooters must first present a current firearms license for the category of firearm to be used to the Range Officer for inspection, sign the range register and pay the range fees, before bringing any firearm to the firing line. Non shooters must sign the visitor’s or un-licensed shooters register. Firearms must have the bolt removed or the action or cylinder open, before bringing it to the firing line or rack. No firearms are to be handled when there are persons forward of the firing line. No shooter under the influence of drugs or alcohol will be allowed on the range. Firearms must be pointed in a safe direction at all times. Safety glasses, hearing protection and fully enclosed shoes MUST be worn. Firearms must be in good working order with suitable ammunition. Firearm safety must be strictly observed. Firearms will not be loaded until instructed by the Range Officer. No shooter may leave the firing line without his firearm having been first cleared by the Range Officer or his Deputy. When the Range Officer gives the command to cease fire, all shooting will stop immediately. When the Range Officer gives the command to unload and make safe, all shooters will remove all ammunition and wait till the firearm is cleared by the Range Officer or his Deputy. Any firearm that develops a fault must be pointed in a safe direction and the Range Officer called. No shooter will handle another’s firearm or ammunition without their permission, except when the Range Officer believes a firearm is pointed in a dangerous direction and either acts or gives instructions to another to reposition or remove it. All shooters not shooting in a detail must remain behind the firing line. Unloaded firearms may be handled for sight adjustment or repair in a designated Safe Area. No ammunition is permitted in the Safe Area. Resetting of silhouettes or changing targets must be done quickly so as not to inconvenience shooters. Smoking is not permitted on or close to the firing line. Mobile phones, I-Pods etc. are to be turned off on entering the Range. Fired cases are to be removed from the firing line. The Gympie Pistol Club is a family club so swearing or bad language is not allowed. The Gympie Pistol Club ranges are Flora and Fauna sanctuaries. Shooting at approved targets only is permitted. Any breach of safety will be reported to the Range Officer. Any infringement of these rules may result in disciplinary action which could result in disqualification from the range for the match or longer. 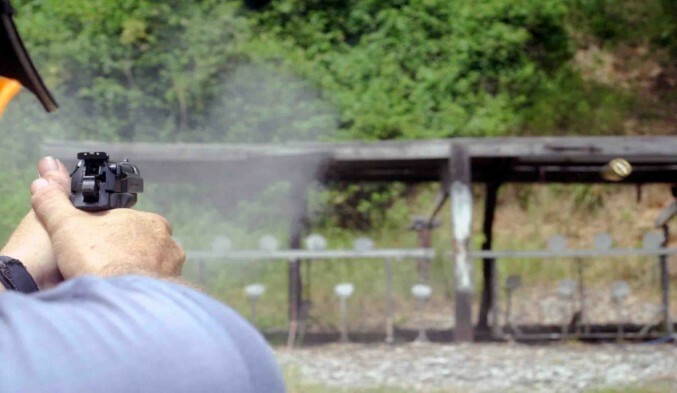 Because everyone at the Gympie Pistol Club follows the rules and regulations we have set down over the last 51 years, we have proven to be one of the safest pistol clubs in Australia. Not too many sporting clubs can claim over 50 years with ZERO injuries !